"How I Found My Style Sundays"
I started Our Southern Home less than a year ago. It has been a wonderful journey making wonderful friends along the way. Pamela has been wonderful answering some of my novice questions here and there. I am loving every minute of it! Through 23 years of marriage, I'd have to say my style has evolved from the old style country of the late 80s to the jewel tones of the 90s. Our first home was a labor of love, and I do mean labor. It was a 70s ranch that had never been remodeled. It had layers of wall paper, shag carpet and beautiful orange kitchen counter tops. We completely remodeled that home learning lots along the way! We later went on to build our current home. 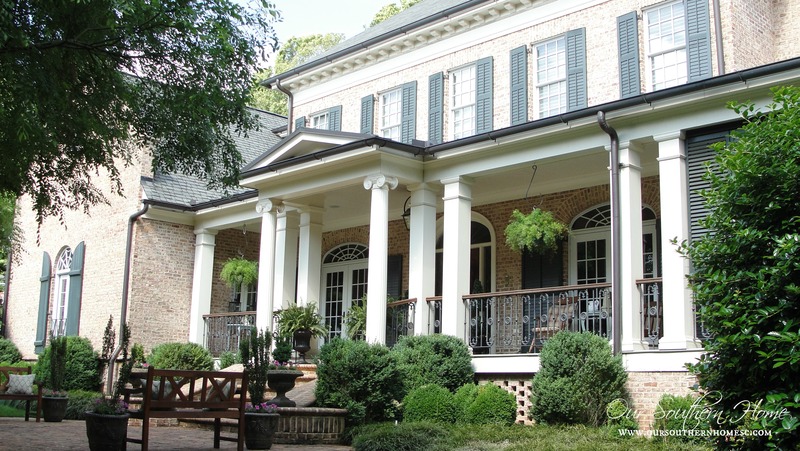 It is a Southern Living House plan, Abberley Lane. We wanted a home with old house charm. Before the building of this home, I'd say my style shifted to a mix of French Country, English Country and traditional with vintage thrown in. That's a mouth full! I love to cook and the kitchen has always been a favorite room of mine! We built our current home in 2004. To this day, I wouldn't change a thing in our kitchen. Our old home had cabinets that I had painted white. I loved it, but was really ready for a change when we moved. 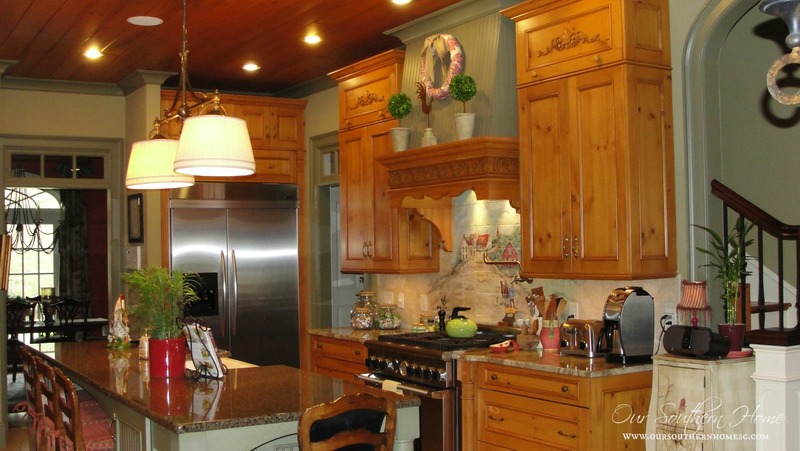 The stained pine perimeter cabinets and painted island have been so easy to maintain. 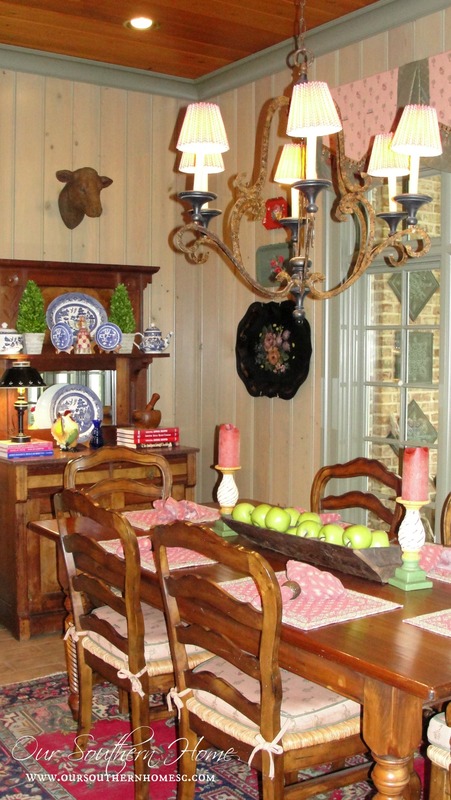 You can read more about our French Country kitchen HERE. The designer Charles Faudree has been a big source of inspiration for me. I love his use of color. I think I own all of his books! I am loving the popular look of all neutrals and whites, but will always be drawn to subtle color. 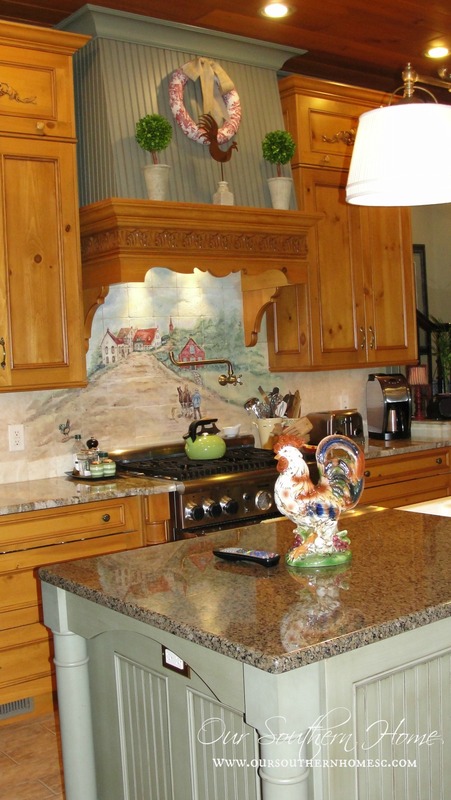 A local tile artist painted and fired the French Country village scene on tumbled marble tiles. 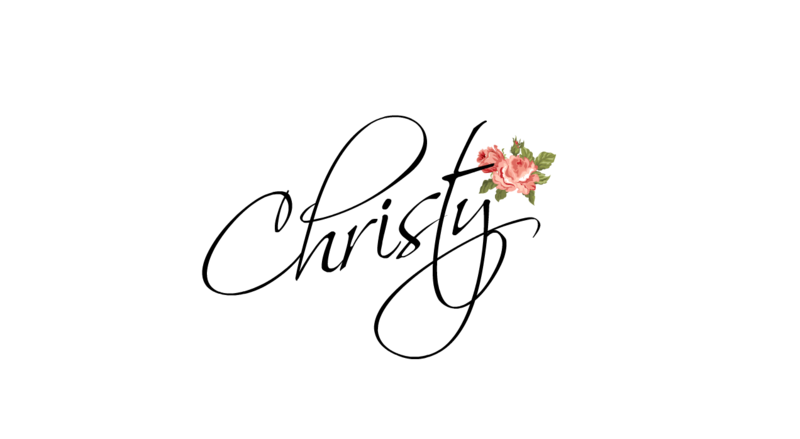 It actually has all of our names hidden within the design! I enjoy incorporating rusty reds, greens, blues and neutrals into my decorating. 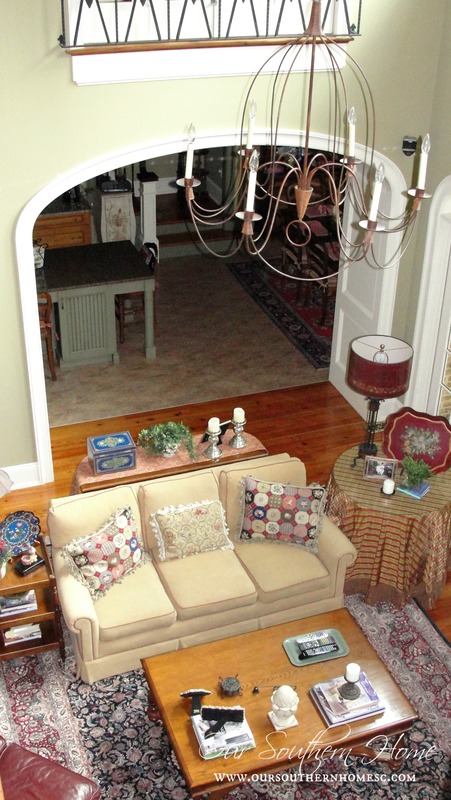 Ebay has been an economical source for my antique rugs, plates and tole trays through the years. The walls in the breakfast area are a green washed Cyprus. The ceiling planks are stained pine. This is one of my most treasured finds in our home. 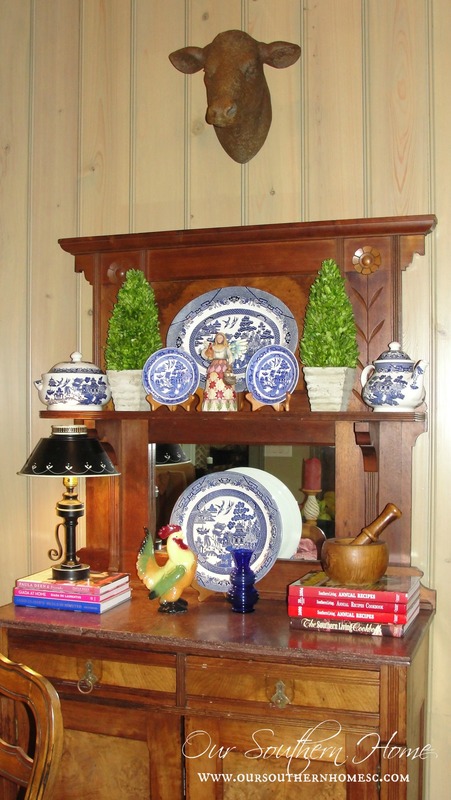 We purchased this antique hutch in Chapel Hill, NC on a weekend away about 13 years ago. It houses my cookbook collection below. Our screened porch is another favorite room in the house. This is really where I showcase my love of vintage casual. 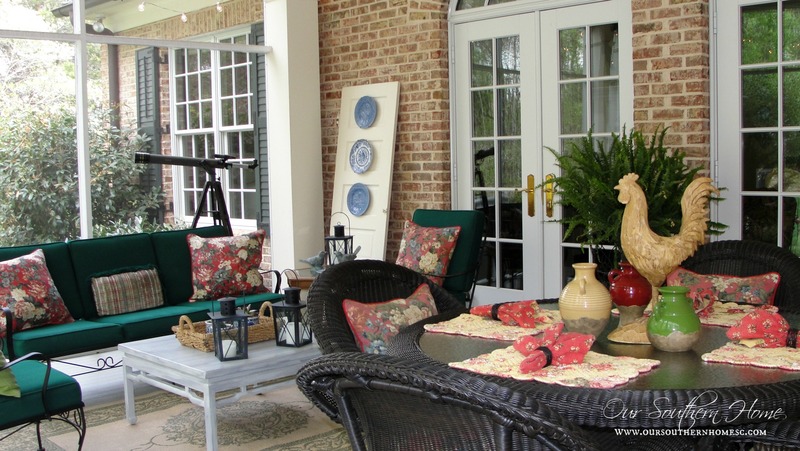 All the furniture with the exception of the outdoor wicker has been a used find and repainted. We eat dinner here most nights late spring (after the nasty southern pollen has run its course) through late fall. You can see more of the porch HERE. The screened porch has access from the kitchen/family room and the master bedroom. 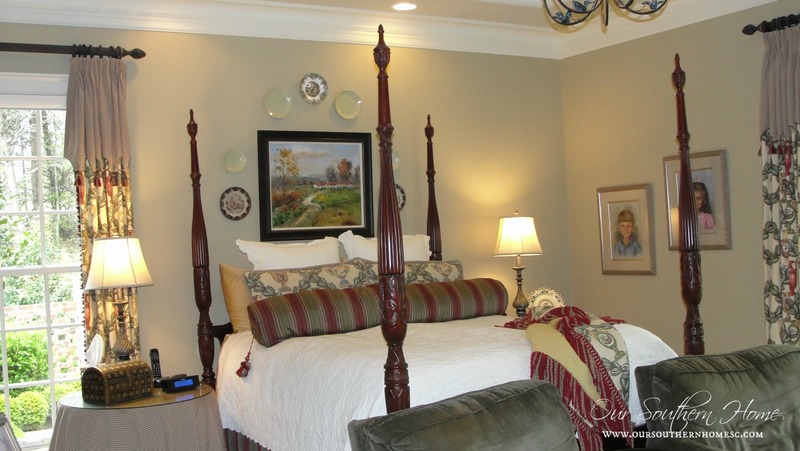 Our master bedroom is traditional with French Country fabric touches and solid mahogany furniture. The window treatments and bedding are 12 years old!!!! I really try to spend money on items that will last the long haul. I still love the window treatments and matelasse bedding. 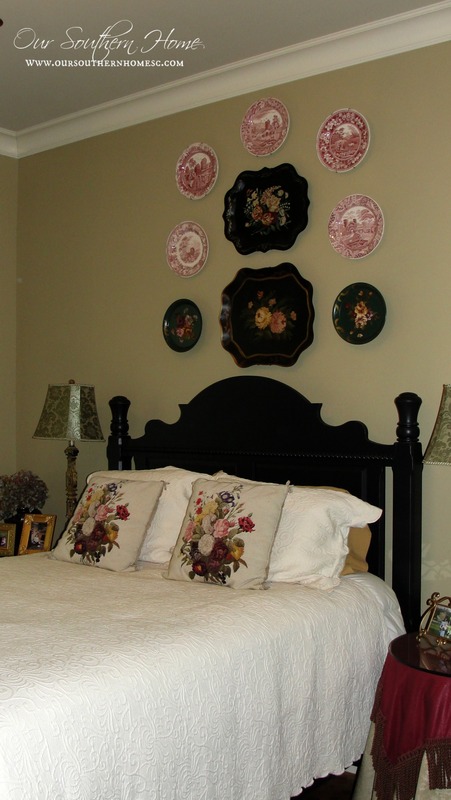 I hope to update the pillows in the very near future to bring in a more vintage, casual feel. While I am really on the furniture re-purposing bandwagon now with thrift store finds, I still have the belief in that you should really try to buy the best quality upholstered pieces that you can afford in high use areas. The couch and love seat are an example of this. They are seventeen years old and on their second fabrics. Yes, they started out jewel toned! They're still as comfortable and sturdy as ever! The guest room is off of the family room and is still a work in progress. I adore collecting tole trays.....a nod to my love of French Country. This is my most treasured piece in our home. We purchased it in Southport, NC. It is an antique painted piece from Germany. It houses my massive yarn stash (confessed yarn hoarder). It used to be in our master bedroom, but in this house it is in the guest room. This is my hubby's study which is probably more English in style with the hunt scene painted along the tile and the oil above the mantel. The two chairs were a newspaper downsizing ad....pre-Craigs List. They were bright yellow!!! I got both for $75! The small table is just one of my chalk paint make-overs. It is so easy to get caught up in what everyone else is doing to decorate. I get asked quite frequently from friends and folks online about paint colors. These days I lean more towards a light, neutral wall color and letting your furniture and accessories pop! Pick and chose those elements from styles you are drawn to and incorporate them into your style that you love. You are decorating your home to make a haven for your family! It is ultimately a matter of what you love! 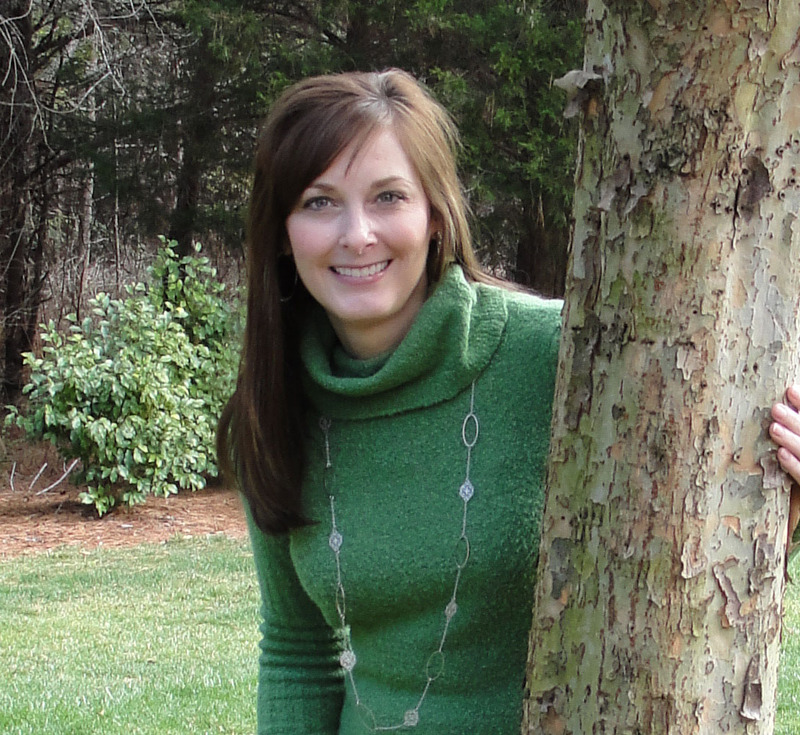 Many thanks again to Pamela for giving me the honor to be apart of How I Found My Style Sundays! I sure hope to meet up with her one day...she actually has family near me in South Carolina! I'd love for you to visit Our Southern Home and follow along! I am so glad that Christy was able to share with us today her beautiful home! I have enjoyed getting to know her this year and she is such a delight. I hope that you stop by her place and get to know her better too! Your home is so beautiful! I adore your gorgeous kitchen and how you've decorated it. Thank you for the lovely tour. Your home is beautiful. I love your kitchen too. I bet you love cooking in there. Everything is gorgeous thanks for sharing your home with us. Christy, your home is stunning and you and I like so many of the same styles and my fave designer is Charles Faudree, too. Of course our taste is always changing and now I love farm house style, too. Lovely, Christy! That German piece is absolutely gorgeous! Thanks so much for sharing your home with us! What a luvly home Christy. I agree... fads ebb and flow, you must find a stlye(s) that is comfortable for you and yours and go with it. Thanks for sharing that fabulous home. I could move right in! 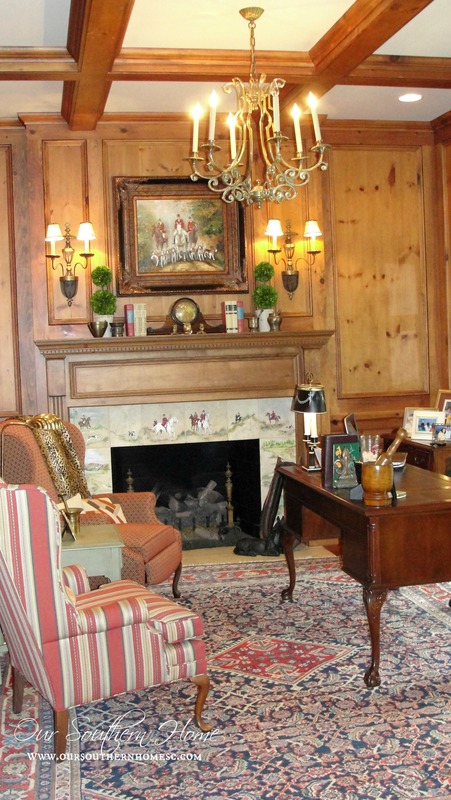 Christy's home is just the right mix of French and English country with a lot of personal statements. I'm in love with her kitchen, I have stained pine as well and just love it, and her wall tiles are gorgeous! I have to show my hubby her husband's office, he would just love it. And the screen in porch...sigh! What a beautiful home! 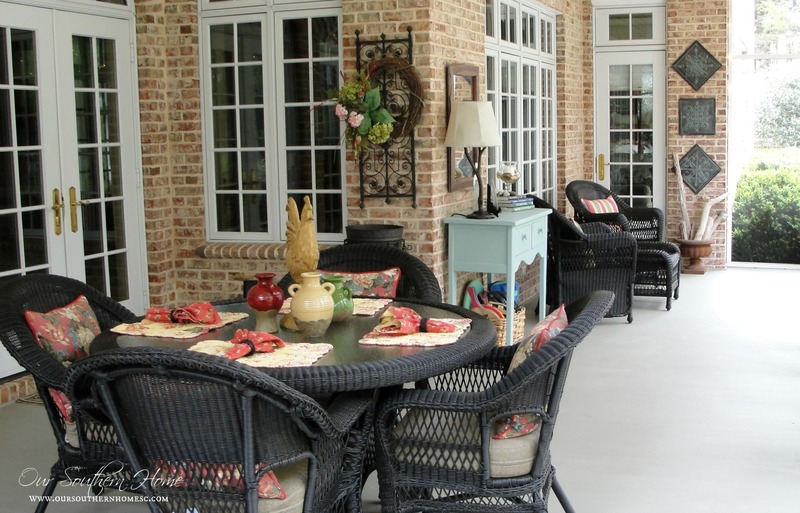 Christy has one beautiful home...love her screen porch area. Christy your home is lovely! I too am a big Charles Faudree fan. Love your painted tile back splash. Pamela, Christy's home is so beautiful! Her kitchen is amazing and I love the office. Many thanks for sharing your home. Your home is very beautiful and I love all the decorations and furniture you have picked. It really looks wonderful. Beautiful home you have! Really enjoyed the tour! So happy to see your gorgeous house featured Christy!! You know I love it! 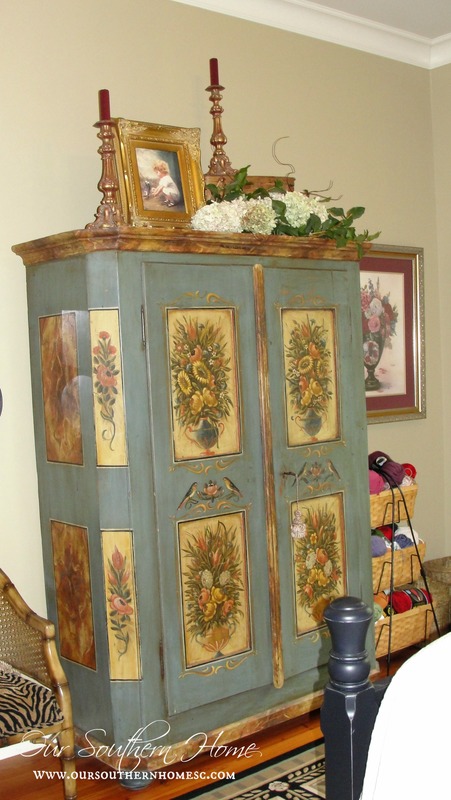 I hadn't seen the antique cabinet from Germany yet...oh my, I adore it!